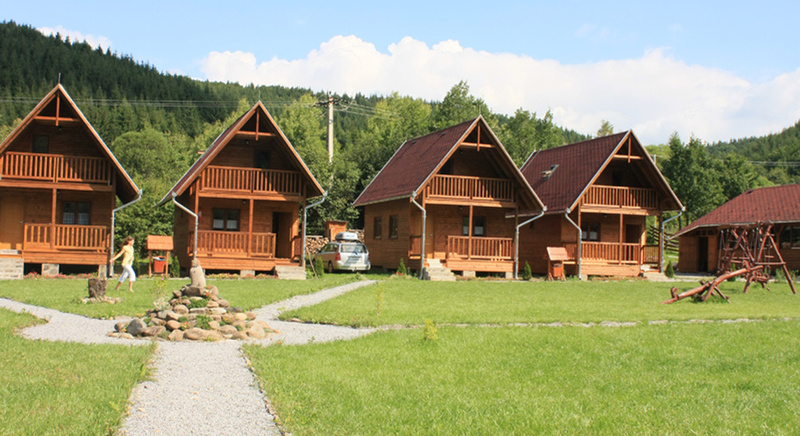 Situated in the beautiful Székely countryside of Ivó, at the feet of Madaras Harghita mountains, at only 24 km from Székelyudvarhely, Irgo key houses welcome you to spend an unforgettable holiday in a pitoresque location, surrounded by pines and bordered by a brook with a lovely, soothing sound. Let yourself be carried away by the beauty and serenity of the landscape and brace yourself for exciting adventures! The 6 guest houses can accommodate up to 42 persons, each house being designed for a total of 7 persons. If you are a larger group, please announce us in advance, so that we can make arrangements in time. On the ground floor there is a living room with a dining table and chairs, a fully equipped kitchen, a bathroom with a shower, toilet and a sink. There are two bedrooms and a bathroom on the upper floor, one bedroom with 2 double beds, the other with 3 single beds. The sweet babbling of the brook, the pitoresque landscape, they playground and the owner’s warm welcome will surely leave you delighted. Our guesthouses are open year-round, and this beautiful area is well worth visiting in all seasons. Facilities: The 6 guest houses can accommodate up to 42 persons, each house being designed for a total of 7 persons. If you are a larger group, please announce us in advance, so that we can make arrangements in time. 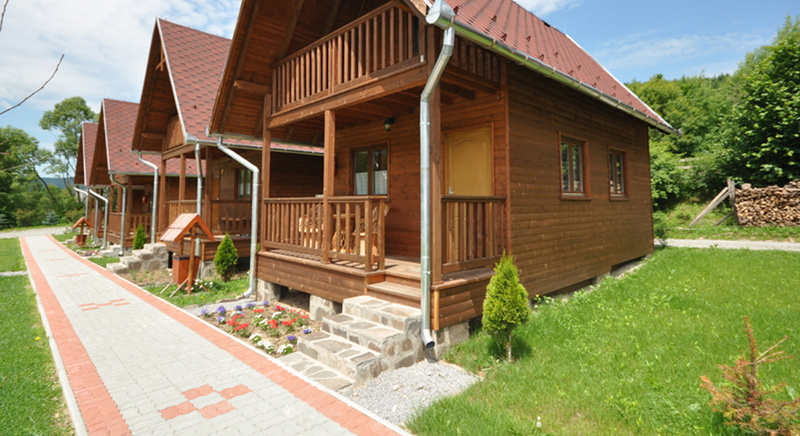 There are two bedrooms and a bathroom on the upper floor, one bedroom with 2 double beds, the other with 3 single beds. The guesthouses are heated with electric heating throughout. In the vicinity of the guesthouses we await you with a venue that can accommodate 120 persons, where you can enjoy a delicious half-board meal and taste fresh local produces prepared by our talented culinary team. 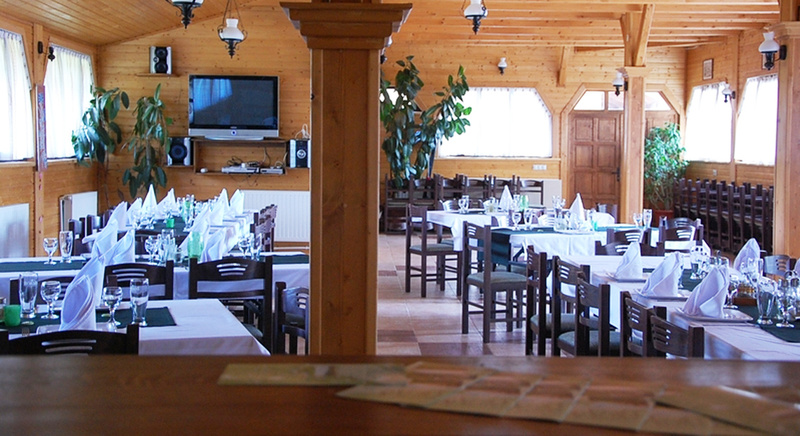 The restaurant is also excellent for parties or other events. We also have a spacious and tastefully decorated courtyard with flowers, outdoor furniture, pergola, barbeque and Hungarian goulash kettle facilities, garden swing chairs for adults as well as children’ playground. We gladly help you make the most of your stay, so we are happy to advise you on activities and hiking tours you can undertake. Must do’s: see the dam lake of Zetea, hike up to the Madaras peak (1801 m). Farkaslaka/Lupeni (the birthplace of the famous Hungarian writer Áron Tamási) - Korond/Corund (famous for its pottery and ceramics)- Parajd/Praid (the salt mine)- Medve-tó/Lacul Ursu (Bear Lake) in Szováta/Sovata –Gyergyószentmiklós/ Gheorgheni/-Lacul Roșu Gyilkos-tó(Red Lake) – Békási-szoros/Cheile Bicazului (the Bicaz Canyon).